Tonight’s moon shines near the border of the constellations Taurus the Bull and Gemini the Twins. This slender moon in the western sky can guide your eye to objects in both constellations. Grab your binoculars, and let’s go outside! As seen from North America this evening, the moon will be next to the faint cluster of stars known as M35, in the constellation Gemini the Twins. You will need a dark sky to see this cluster near the foot of Castor (the mortal twin), but it should be visible to the eye, with an apparent diameter about the same as the full moon. Dark sky is needed to see it in all its glory! M35 is an open star cluster. 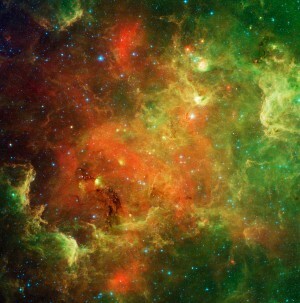 It consists of several hundred stars, and lies about 2,800 light-years away. The cluster is thought to span about 24 light-years from one edge to the other. The moonlight glare will probably obscure this cluster tonight, but try looking at M35 with binoculars on a dark, moonless night. You might need binoculars to see Zeta Tauri tonight in the moon’s glare, too. 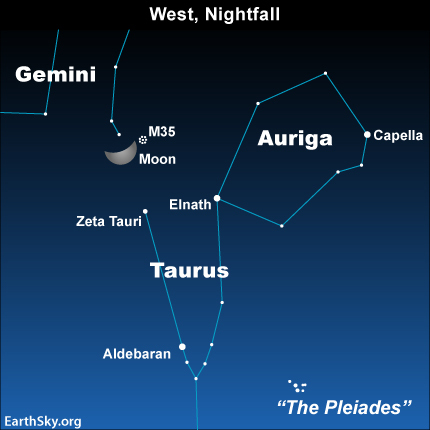 In Europe, the moon will be shining about midway between M35 and Zeta Tauri, the faint star that marks the tip of Taurus the Bull’s southern horn. As seen from Asia, the moon will be next to the star Zeta Tauri. A much brighter star is Elnath, the tip of the Bull’s northern horn. Elnath or El Nath is a hot, blue-white star about 130 light-years away. It is the 25th brightest star in the sky. At one time Elnath was part of the constellation Auriga, completing that constellation’s former pentagon shape. As such, it was known as Gamma Aurigae. However, celestial mapmakers later assigned this star to Taurus, and it became Beta Tauri. What else can you notice tonight? Well, have you been watching the waxing crescent moon over the last few evenings? If so, you might have noticed that the moon moves day by day relative to the backdrop stars. On average, the moon moves 13 degrees per day eastward (the width of the moon approximates one-half degree). Therefore, if you go outside at the same time every night – between the new moon and the full moon phases – you will easily see the moon’s motion in orbit around the Earth. Watch the moon on April 9. It can guide you to objects in Taurus and Gemini – and expand your thinking to include the moon’s eternal motion.